American Star with Hanging Slats Arrow Replacement, by K & K Interiors. Show your patriotic pride with this flag arrow replacement! Navy blue top of the star is accented with tiny dimensional stars, and the red and white slat "stripes" dangle below. Special order. Americana Crow Arrow Replacement, by K & K Interiors. 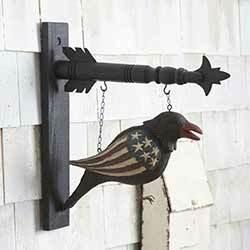 This primitive crow is decked out in patriotic pride, with stars and stripes wings! 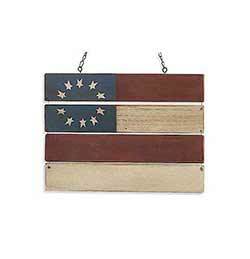 Made of wood-like resin, painted in country Americana colors, antiqued for a distressed look. Special order. Americana Heart Arrow Replacement, by K & K Interiors. 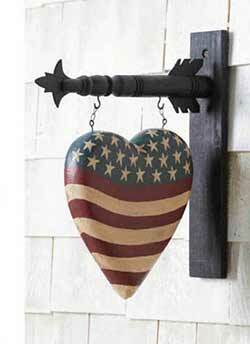 Display your love for the stars and stripes with this patriotic heart arrow replacement! Show your patriotic pride with this patriotic star arrow replacement! Features stars and stripes pattern and crackled surface for an aged look. Special order. Anchor Arrow Replacement, by K & K Interiors. 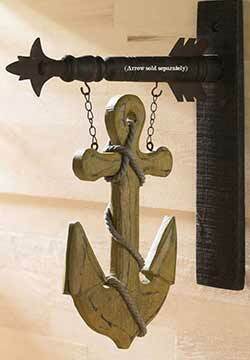 Go nautical with this anchor arrow replacement! 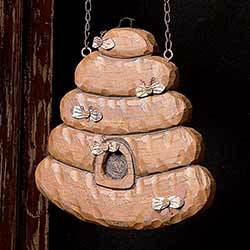 Made of wood like resin, distressed for an antiqued look, with rope accent. Special order. 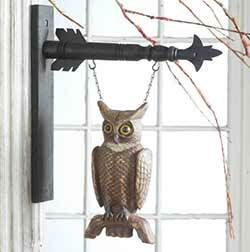 Give your country home rustic charm with this barn owl arrow, great for a cabin, house in the woods, or fall decor! SPECIAL ORDER. 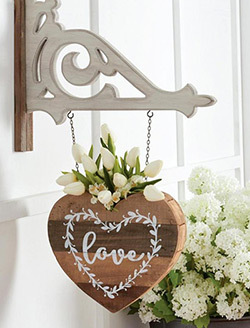 Perfect for a rustic wedding, neutral Valentine's Day decor, or setting a romantic tone in your farmhouse home, this rustic barnwood heart arrow replacement has an opening in the center for filling with your favorite flowers or greenery! Beehive Arrow Replacement, by K & K Interiors. Show your love and support for honeybees with this bee skep arrow replacement! Special order. Believe Star Arrow Replacement, by K & K Interiors. 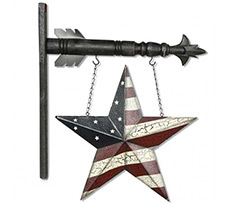 Available in a wide variety of designs, these best-selling arrows are a wonderful and unique accent to your home! 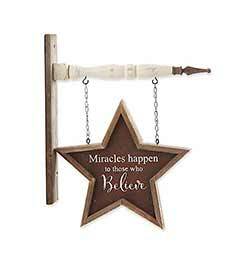 This one reads: "Miracles happen to those who believe." SPECIAL ORDER. 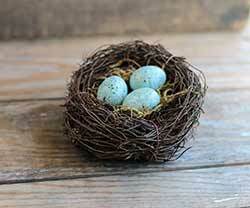 Twiggy nest with a trio of blue speckled faux bird's eggs - Great for natural spring decorating! 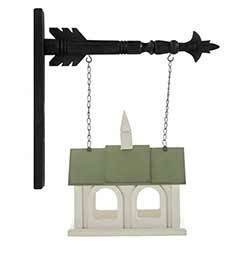 Perfect for spring decorating, or any nature-themed look, this arrow replacement is fashioned after an open style birdhouse, white with a green roof. Black & White Cow Arrow Replacement, by K & K Interiors. 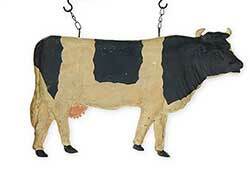 Perfect for the farmhouse, dairy, or cow lover, this arrow replacement features a classic black and white cow. SPECIAL ORDER. Who doesn't love a darling country cow? This farm friend is classic black and white, with the addition of a little bell around it's neck. Black & White Pig Arrow Replacement, by K & K Interiors. 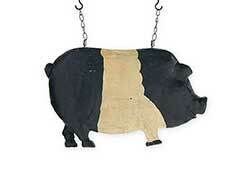 Perfect for the farm or pig lover, this arrow replacement features a classic black and white pig. 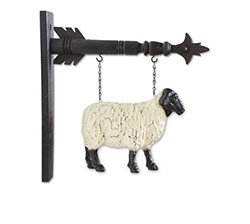 A beloved symbol of peace, the sheep is an iconic piece of the English or American countryside, a popular image in country and primitive decor! This rustic sheep has a white body, and black face and legs. Special order. 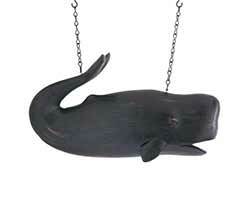 Black Whale Arrow Replacement, by K & K Interiors. Perfect for coastal homes or beach cottages, this black whale arrow replacement makes a nautical statement! Special order. Black Wooden Arrow, by K & K Interiors. 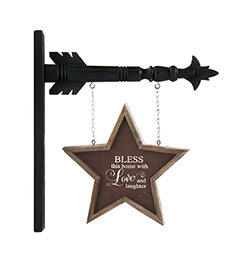 Available in a wide variety of designs, these best-selling arrows are a wonderful and unique accent to your home! This is for the Black Wooden Arrow hanger only. 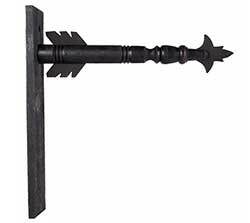 Available in a wide variety of designs, these best-selling arrows are a wonderful and unique accent to your home! This one reads: "Bless this home with love and laughter." SPECIAL ORDER. 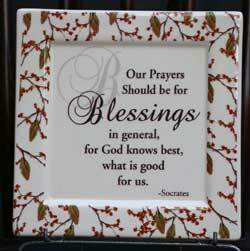 Blessings Ceramic Tile, by K & K Interiors. Use this ceramic tile as a snack plate or hang on the wall as art! Has keyhole hanger in the back. Printed with bittersweet vines and leaves, and reads: Our prayers should be for blessings in general, for God knows best, what is good for us (Socrates). Measures 7 inches. Brown Horse Arrow Replacement, by K & K Interiors. 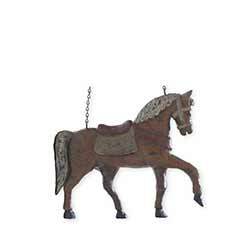 For your farmhouse or western decor, this horse is painted brown with light mane and tail, and red saddle. Special order. Brown Running Rabbit Arrow Replacement, by K & K Interiors. 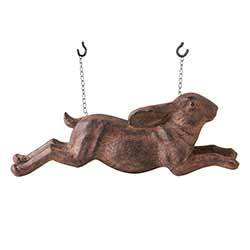 This rustic rabbit arrow replacement will look beautiful in your farmhouse country home, perfect for spring or Easter! Made of resin, painted brown and distressed for an antiqued look. Special order. Give your home whimsical charm this holiday season with this candy cane pair arrow replacement! 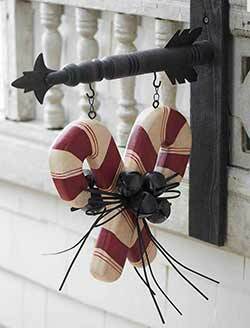 Features red and white striped criss-crossed candy canes, accented with rustic jingle bells. Carved Flag Arrow Replacement, by K & K Interiors. 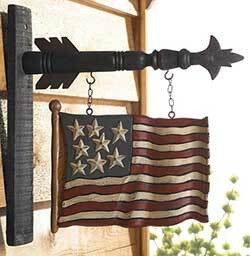 Display your American spirit with this flag arrow replacement! 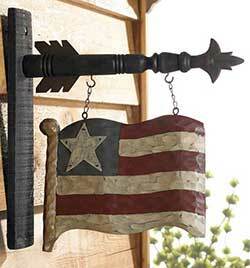 Features carved stars and stripes, in a primitive antiqued red, white, and blue color palette. SPECIAL ORDER. 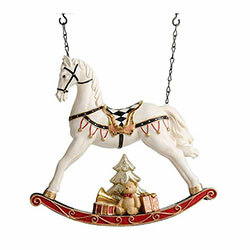 This beautiful rocking horse arrow replacement is sure to make a statement on your wall this Christmas! 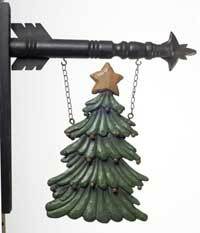 This simple evergreen tree arrow replacement will look great in your home all winter long! Accented with rusty jingle bells. 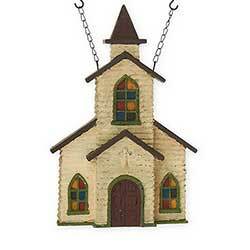 Make a statement of faith and country charm with this old fashioned church arrow replacement. SPECIAL ORDER. Colonial Flag Arrow Replacement, by K & K Interiors. This colonial star is made of slats painted in a primitive stars and stripes pattern. 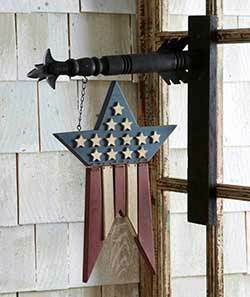 Great for the country Americana home! Special Order. 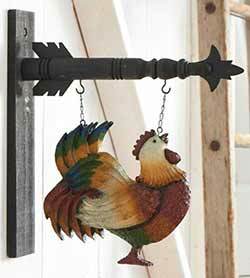 Give your country home personality with this rooster arrow, in a muted, rustic color palette for that folk farm look! SPECIAL ORDER. 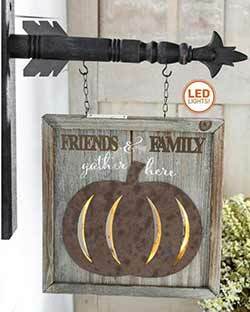 Give your farmhouse home rustic charm this fall with this pumpkin arrow replacement, with a welcoming message, plus it lights up! SPECIAL ORDER. 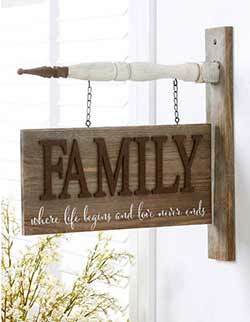 Features raised "FAMILY" letters and painted white script inspirational phrase against rustic wood. Reads: "Family: where life begins and love never ends." 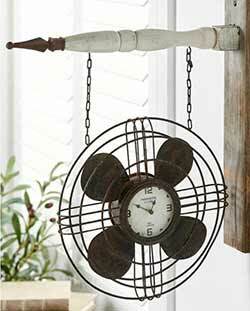 A unique take on the arrow replacement collection, this one features an antique style fan, with a clock in the center. Great for a farmhouse country home, or a study! 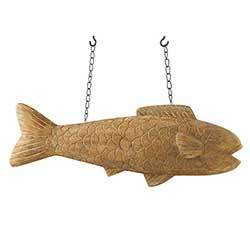 Make a statement at your lake house or cabin with this fish arrow! SPECIAL ORDER. Fish Bait Arrow Replacement, by K & K Interiors. 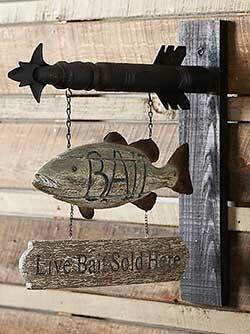 Picture this "Live Bait Sold Here" fish at your cabin, man cave, or lodge themed home! Measures approx 9 x 14 x 2 inches. SPECIAL ORDER. Fishing Stories Arrow Replacement, by K & K Interiors. 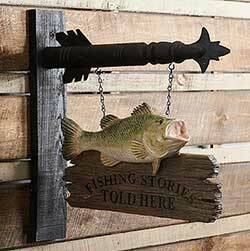 Picture this "Fishing Stories Told Here" fish at your cabin, man cave, or lodge themed home! Special order. 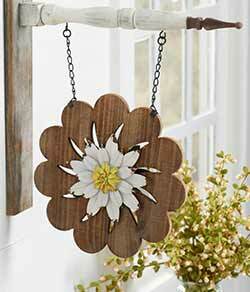 Perfect for spring decorating, this arrow replacement features a dimensional white flower with yellow center against a rustic wood background. Gray Rooster Arrow Replacement, by K & K Interiors. 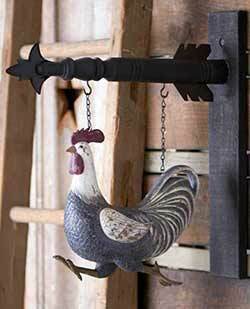 Give your farm-inspired home personality with this gray and white running rooster arrow, in calm neutral colors too coordinate with a variety of decorative styles! SPECIAL ORDER. Happy Halloween Owl Mug, by K & K Interiors. 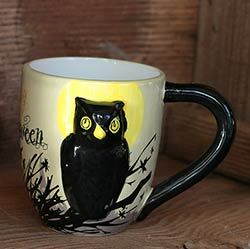 Decorative earthenware mug featuring a dimensional and decal image of a black owl on branch with a full moon. Background is light tan, and reads "Happy Halloween." Measures 4 inches tall, by 5 x 3 inches. Plate also available! 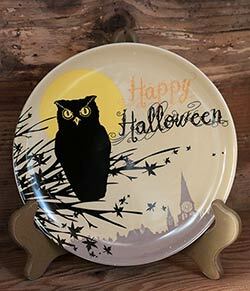 Happy Halloween Owl Plate, by K & K Interiors. Decorative earthware plate featuring a decal image of a black owl on branch with a full moon. Background is light tan, and reads "Happy Halloween." Measures 8 inches in diameter. Plate stand sold separately. Mug also available! 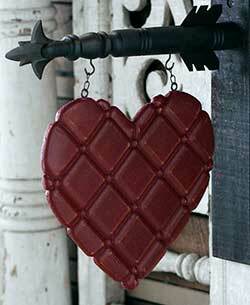 Perfect for winter and Valentine's Day, this is for the original heart arrow replacement, in dark burgundy red with "quilted" texture.